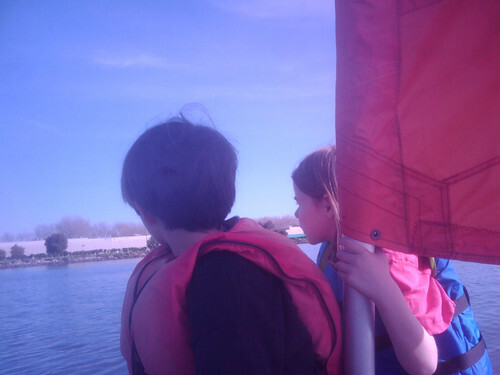 Our tiny inlet is perfect for rowing and sailing around. The water is glassy calm at low tide. Once the boat gets out of the inlet where the dock are, we’re on Redwood Creek. The few times we’ve been out, the wind blows from the northwest, sending us straight up the creek. 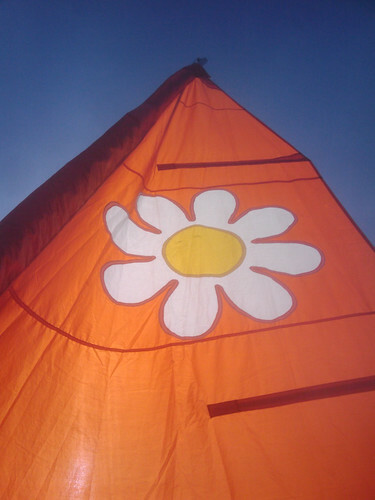 Our dinghy is named “The Daisy”, after the flower on its bright orange sail. The guy who made the sail back in 1965, and who helped to design and make the tiny boat, intended it as an emergency lifeboat for his California-to-Alaska run. It has a hard chine double hull with foam in between the hulls, so it’s hard to capsize and floats no matter what. The oars float and are built into the oarlocks. It has a sugar scoop, two little platforms in the back just under the waterline, designed to make it easy to get back in the boat if you fall overboard. To an experienced boat person I think it looks like Frankenboat and extremely silly. But it’s so cute! 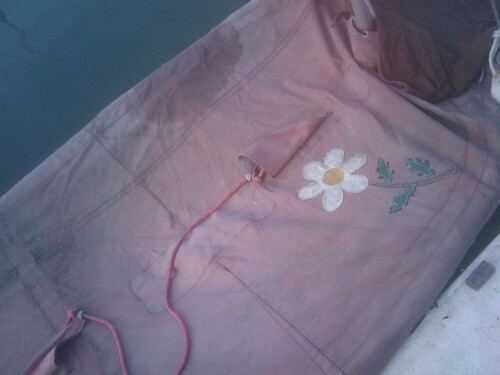 The sailmaker’s art shines out in the boat cover, stitched in patchwork pieces that reflect the shapes of the mast step, daggerboard, and thwarts below – and with another daisy stitched in too. The gunwales of the boat and the oar handles have hand sewn leather linings, I guess for comfort. We recorded some voyages of the Daisy on Android phones with Maverick, but the tracks didn’t upload or save correctly so I can’t show you how hilariously we wandered in zig zags and circles around the creek and the mouth of the inlet! If we take apart the 2hp motor and get it working, I’ll let you all know. For the voyages I packed bags of pretzels for the hard tack. 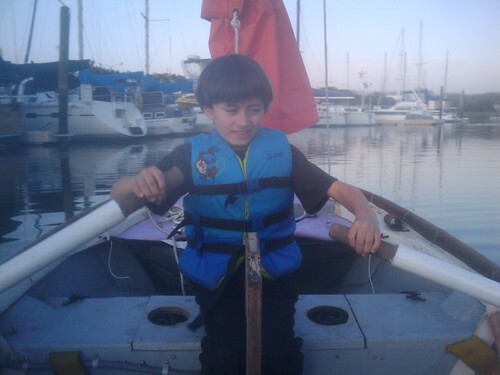 On my list of things for the boat: extra rope for kids to practice tying knots, a laminated chart or two with markers, tiny bird book, extra jackets, a spyglass, string and a stick (for fake fishing). What else would be good for our able seamen before the mast? 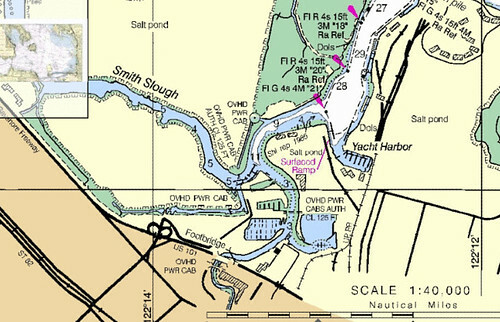 The charts are free from NOAA and here’s our particular marine charts of the San Francisco Bay. Here we are on the map! While geeking out on maps and charts we edited in our own docks on Open Street Map. It’s amazingly easy to edit. You make a profile, sign in, then click “edit” on the map. Overlay the satellite image from Google Maps, then trace out paths (ways) and points and label them. The docks I made are type man-made:pier floating:yes. I had no idea OpenStreetMap had gotten so cool. I looked up who else in my town is editing it. The other person who edits my harbor also seems to trace out paths in the zoo and other fun public places. As in our trip to Ephemerisle, I found that being in a boat was peculiarly freeing. Not being great at walking around didn’t make me different than anyone else — none of us could walk on water! We were all in the same boat. I can scramble across the thwarts and hold the tiller and row as well as anyone else. I felt pretty much like I do in my wheelchair – in a small vehicle with particular constraints that I move around using my arms. This entry was posted in Boats! and tagged boats, rowing. Bookmark the permalink.